I’m going to come right out and say it: I absolutely ‘love lavender’. While you can interpret the name of this wedding blog in different ways, there is no denying that lavender plays a role in shaping our blog’s identity. With that in mind, I thought it was finally time to see how you can use dried lavender for your wedding ceremony, reception, and even after your big day! Lavender is known for its many uses and benefits. The website Medical News Today cites that lavender can be used to treat anxiety, depression, and fatigue. This is because when you inhale dried lavender’s scent, you may benefit from its calming, relaxing, and sedative properties. Likewise, a quick article on essential oils states that lavender can help you get a good night’s sleep. Before you go to bed, just sprinkle some lavender drops on your pillow and you’re all set. 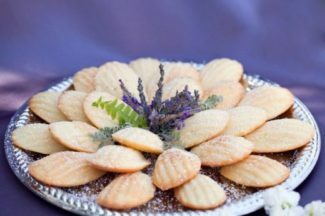 Aside from the health benefits mentioned above, you can also use dried lavender for your wedding and other occasions. 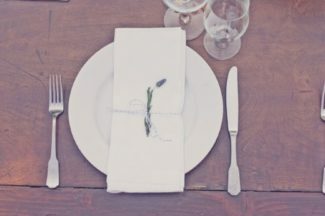 ​Why Use Dried Lavender for Your Wedding? Lavender is a symbol for joy, luck, and devotion – A wedding is a time for celebrating family, friendship, and devotion. 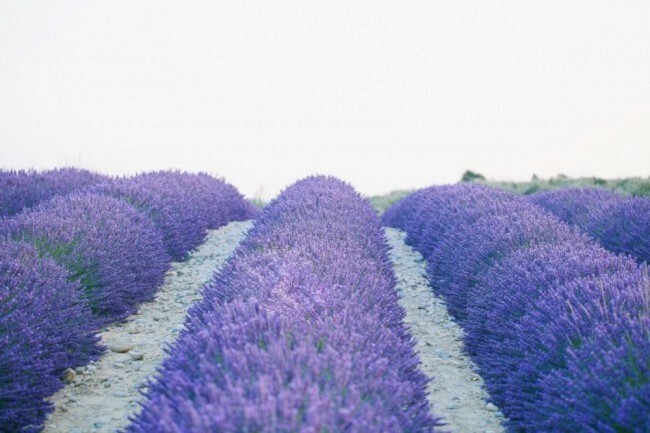 The lavender plant is a symbol for all of these positive traits. It is not surprising that many people use lavender at a wedding or other important event. Lavender is easy to work with – You can use lavender in a floral bouquet, boutonniere, table arrangement, or even as a wedding favor giveaway. The plant is easy to work with in either dried form or as a fresh bunch. Harvest a fresh bunch from your own (or a friend’s) garden and see for yourself how easy it is to create wonderful lavender handiwork.. It gives off an amazing aroma! Wedding Aisle – Instruct your flower girls to throw some dried lavender buds while walking down the aisle. As the bridesmaids follow and step on the lavender, the buds release a wonderful fragrance. The scent will linger in the air as the bride takes her turn walking down the aisle and even afterwards! Ring Bearer’s Pillow – Add lavender buds to the ring bearer’s pillow for a classic look. Then, catch a whiff of its scent as the ring bearer hands over the pillow during the ring ceremony. Chair Decor – Tie bunches of dried lavender and place on every row or pew at your ceremony. Alternatively, add bunches to the floral arrangements around the venue. Unity Candle – As the name implies, a unity candle symbolizes the promise made by the bride and groom to stay together. Some people call it a “promise candle.” You can make your own candle more memorable by decorating it with dried lavender. 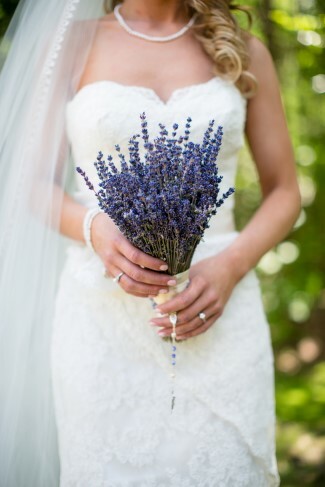 Flower Bouquets and floral Crowns – We simply love the timeless look of a lavender bridal bouquet! Don’t forget to include some in the bridesmaids’ bouquets too. That way both the bride and her gals can enjoy the relaxing scent of lavender while holding the bouquet. 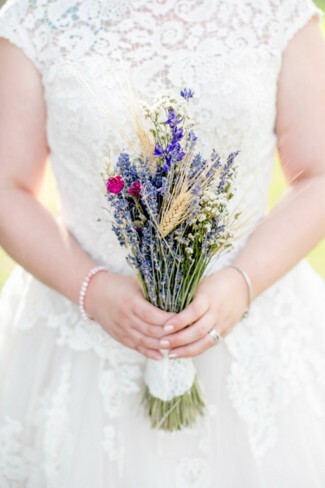 Dry out the lavender bouquet after the wedding to keep as an everlasting keepsake of your wedding day. Wedding Toss – As an alternative to rice try using lavender as a wedding toss. 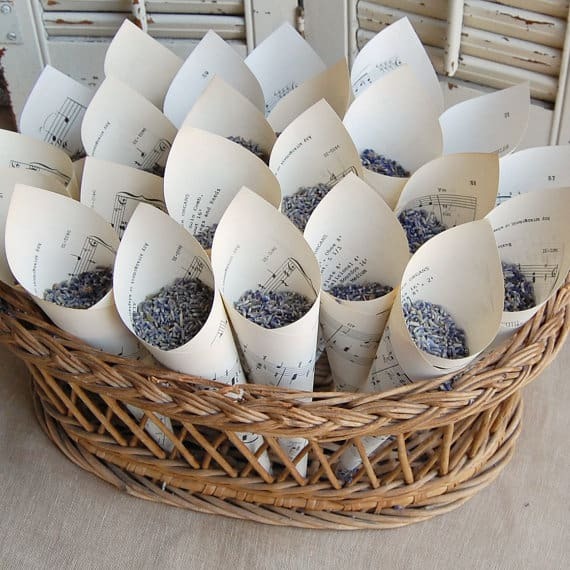 Simply put some dried lavender in small net bags, and distribute to each guest. When the time comes for the happy newlywed couple to depart, guests can toss the lavender buds in the air … or more likely at each other! Place Cards – Add a classic look to your table arrangements by putting a small lavender sprig in each place card. Your guests will be delighted by the gesture. They might even keep the place card as a remembrance of your special occasion. Candles – Scented candles add a romantic flair to any table arrangement. Create an even more natural and romantic atmosphere by putting some dried lavender along with your candle decorations — or better yet just get a few lavender scented candles! Keep in mind that not all wedding venues allow real candles. So be sure to check with the venue ahead of time in order to avoid candle disappointment. Food Table – Add a romantic look to your food table by placing some sprigs of lavender here and there. You can place them in empty wine bottles or glasses, or sprinkle some lavender buds around the wedding cake and dessert table. 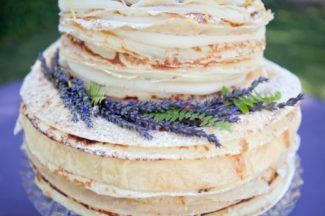 Wedding Cake – Did you know that cake bakers can make lavender cakes or pastries? In fact, it is also possible to make lavender-infused cookies and ice cream! DOUBLE YUMM!! Your wedding cake and favors will not only taste great, they will smell good too. Wine Glass – An unusual idea I came across that I think you should try at home first. I haven’t tried it myself, but certainly want to for my next house party. Place a sprig of dried lavender in each wine glass to create a distinctive scent and flavor. Aside from that, I’m thinking you could also put a few sprigs of lavender in the punch bowl. Wedding Gifts and Favors – Lavender can be used to enhance your wedding favors and gifts in many ways. You can place dried lavender in potpourri sachets, baskets, and other loot bags. You can also have some lavender-scented candles made to be given as wedding favors. Storage Boxes – Put some dried lavender into the box that you plan to keep your wedding gown. This will help keep your wedding dress smelling great for a long time. 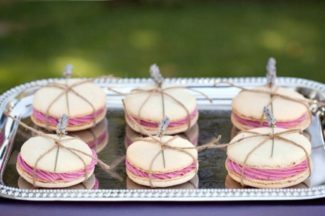 While you’re at it, put some lavender into the boxes where you plan to keep your wedding candles, ring bearer pillow, invitations, and other souvenirs. Shoe Box – Keep your wedding shoes smelling great by placing dried lavender into the shoe box. Who knows, you might use them again for your wedding anniversary or other occasions. 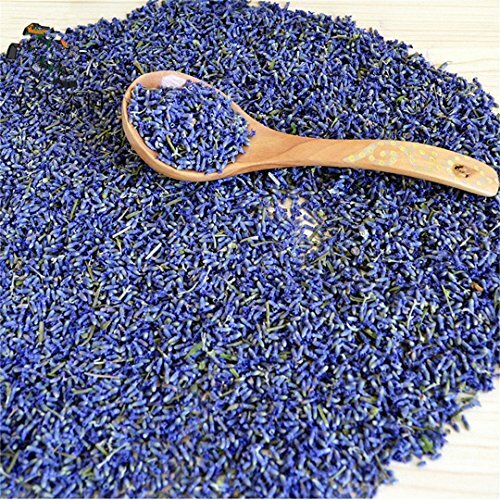 Lavender Bath – Don’t throw the leftover lavender away! I can think of one great use for leftover dried lavender on your honeymoon — sprinkle into a hot bath and indulge in a relaxing soak. Pillows – Place some dried lavender under your pillow before going to bed. The relaxing scent will send you to dreamland in no time! Breathe in the calming aroma as you tuck into a restful sleep. ​If you want to add natural beauty and romance to your special day, consider the following dried lavender options. 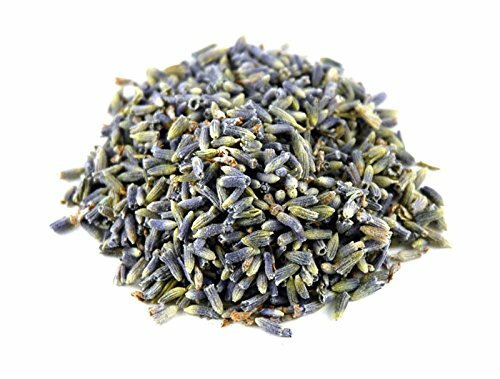 buy organic or regular grade lavender buds to make your wedding sachets and favors! 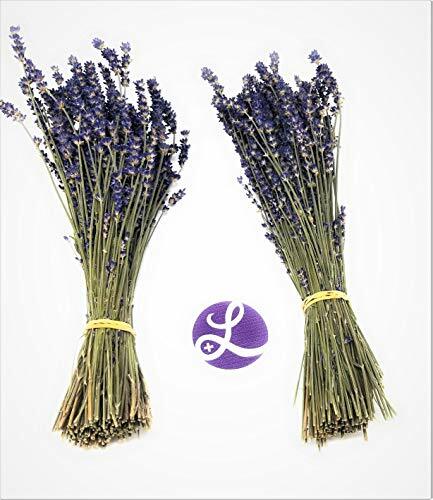 check out the selection of wonderful dried lavender bunches on Amazon. A lot of Lavender per pound! Very fragrant quality French lavender. Extra blue purple in color.